Deploying the validation server on Canonical hardware and managed by the IS team. Deploying the web gallery to trophies.ubuntu.com. Updating the client to support publishing to trophies.ubuntu.com (publishing is not switched on by default and has to be enabled). Packaging and releasing the daemon and viewer in the Ubuntu Software Center. Performing a round of QA and testing to ensure the quality of the release is high. I just wanted to provide a quick update on this. Canonical IS recently provisioned the machine that the validation server and web gallery will run on. Yesterday Michael Hall and I re-deployed the validation server on a CanoniStack instance to ensure the deployment instructions worked correctly. Mike then went onto deploy the web gallery and update the deployment instructions there. We expect IS to deploy this in the next few weeks and then I will shut down to current validation server that is running on my own Bytemark server. Thanks again to Bytemark for providing the server for free to support the project! Share your community achievements with the world! Getting fit wasn’t fun…until now! What is neat about this is that this support makes use of the Online Accounts feature in Ubuntu, so you simply authenticate with your Fitbit account and then you are good to go. Read more about this from Matt, from Chris, and from Rafal. Ubuntu Accomplishments in Ubuntu 13.04 is going to be an awesome feature and achievement for the project. While it won’t ship by default in Ubuntu 13.04, it will only be a click away in the Ubuntu Software Center. You can also find out how to get the development branch set up and if you have any questions feel free to reach out in #ubuntu-accomplishments on Freenode or on our [mailing list](https://wiki.ubuntu.com/Accomplishments/GetInvolved/DevelopmentSetup. It looks like Ubuntu is going commercial. Lots of things to buy and a lot of advertisements for a free and open source operating system. The fitbit work is not commercial – there is no revenue that goes to the project – it is just support for fitbit badges in the same way we support Facebook and Twitter integration. How does supporting a web service is going commercial? I wrote that accomplishment set along with Chris. We did it in our own time. It’s not part of Ubuntu any more than an iPhone app is “part of” iOS. If you don’t like Fitbit or don’t have one, then don’t install it. It’s that simple. There is nothing to “buy” unless you really want a FitBit. There are no advertisements other than my blog post and a link in the FitBit accomplishment to purchase one, for people that are interested. I guess you’re going to be in for a big surprise when you find out that the Software Center sells commercial apps. If so, did you contribute your work back? I have had a Fitbit for many years, but almost never used it because of lacking support for Linux. When will I be able to start using this? I’d love to get my hands on it ASAP! No it’s not. The accomplishment stuff doesn’t talk to the device at all, we just use Fitbit.com’s APIs to query your badges. They have an API specified at http://dev.fitbit.com. Chris wrote a plugin for Ubuntu’s Online Accounts and then we just use OAuth to talk to fitbit’s web API. I have the new Fitbit One and so far I’ve not been able to get it to talk to libfitbit, but I didn’t try very hard yet. Absolutely everything we do will be sent upstream if we make progress there. All the code for the accomplishments stuff is open as well. So, let me try to see if I understand you: This Fitbit integration only figures out your score from the website and displays it. But you will still need to upload the data from your fitbit with a pc with Windows or Mac OS? If that’s the case, I really hope you’re planing on helping libfitbit past the finish line, so that it works well before 13.04. If not, I don’t understand the point of the Achivements Fitbit integration? Ah, ok, then I misunderstood. Thanks! Do you know of a guide somewhere on how to use libfitbit? Is there a GUI for it? Ah, ok, then I misunderstood. Not ideal, no, but at least it makes sense then. 🙂 Thanks! Been waiting for an update on Ubuntu Accomplishments. Everything looks promising. Great work Jono and Team. OpenBadges works quite differently to Ubuntu Accomplishments – UA is designed to detect if something was achieved as well as displaying it. But shouldn’t Ubuntu/Canonical be an OB Issuer, and each Accomplishment be sent to the OB Infrastructure? And then also be an OB Displayer and show OBs in the UA viewer, as you say, in addition? It’d be quite strange for Canonical to launch something like this, and not integrate it fully (or at all) with the great effort the other big, well known consumer level Free Software creator (Mozilla) is doing to create a Free and Open system for unifying all badges from all kinds of places into one place/system! Don’t you think? Firstly, this is not a Canonical project, but a volunteer project created by volunteers in their spare time. It is only now we are starting to deploy it, but fundamentally this is something our community works on. Secondly, as I mentioned earlier, this and OpenBadges are quite different. 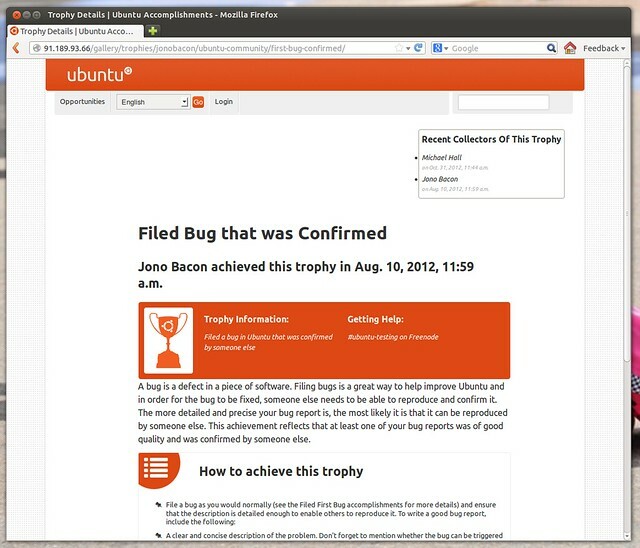 Ubuntu Accomplishments is not just a means of showing trophies but is also a schema for trophies, logic for detecting when trophies have been achieved, a validation and signing process, and more. OpenBadges is different. Oops, then I’ve misunderstood again! Sorry! You could probably write an accomplishment pretty easily if you want to try. The guys on #ubuntu-accomplishments would be happy to help. Jono… Thought I’d ask this here also. Remote Desktop capability is important to many Linux users. With Ubuntu 12.10 Canonical is dropping Unity-2D and Gnome has announced with Gnome 3 they are dropping “gnome-fallback”. I understand why these moves are being made but what thought is there to what can be done to enable future “remote desktop” capabilities to Ubuntu. OpengGL requires a graphics card to write to and Nomachine’s NX, x2go, VNC etc will not function. Any news on what will be in place for these users? Jono, First, let me get the necessary tone-setting praise out of the way… This is a very good idea, and working (while slowly) towards improving it to the point where it can be on by default (especially for OEM installs) is a good thing to see. Okay that’s out of the way…. Is there any discussion or roadmapping about taking Accomplishments to the point where it can start breadcrumbing out (daily/periodlic) challenges/quests/missions to users as to what to try to accomplish next? From a gamification pov… can you ask users to self-identify as a character class and breadcrumb out a set of missions or quest objectives and have them “level up” along that character classes’s profile… given them of course the option to change their character class and get a new set of pre-cooked challenges. And if you go that route, can you pre-package sequentially more complex challenges to put in front of users to draw them further along the technical literacy learning curve?